February 12, 2019 Episode 9: Lagered Tales, presented by Beau’s. In our ninth episode of the Beau’s podcast, Canadian musician, author and publisher Dave Bidini discusses West End Phoenix, the monthly community newspaper for Toronto’s West End, and the importance of print journalism in the digital age; upcoming plans for Rheostatics, the Canadian indie rock mainstays of which he’s a founding member and the guitarist; and what it was like when Prime Minister Justin Trudeau touched down to the Phoenix’s offices last month. One of our producers shares with our hosts and listeners an update on the Rwanda Craft Brewery Project, and introduces Jessi Flynn – providing some resolution to our last episode’s cliffhanger. We’re also treated to an amusing story about Beau’s head brewer Kevin James’ visit to Düsseldorf, Germany, where he did some research for our Altbier recipe, and found out firsthand a little about the city’s rivalry with nearby Cologne. 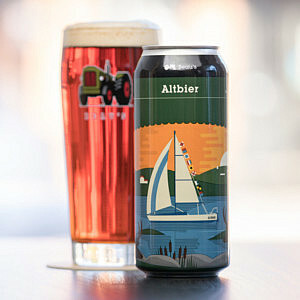 Then, esteemed brewer, consultant, writer and lecturer, Horst D. Dornbusch, author of Altbier: History, Brewing Techniques, Recipes (1998, Brewers Publications), offers us a brief history about said rivalry with a focus on the cities’ respective beer styles, Altbier and Kölsch. Finally, one of our producers talks to some record collectors, our own Davey D. a.k.a. DJ Dirtnap, and our friend that darn Robbo, about their favourite albums and tunes – including some classics and some truly offbeat selections – and pairing Beau’s Altbier beer with music. Learn more about Beau’s Altbier. Learn more about Beau’s feBREWary. Learn more about Beau’s St. Patrick’s Party. Hosts: Kimberlea Jones and Denis Routhier – catch ’em co-hosting at #BeausStPats Saturday, March 16 in Ottawa!